It's coming up to the end of the year so I thought I'd share my top five beauty products of this year. 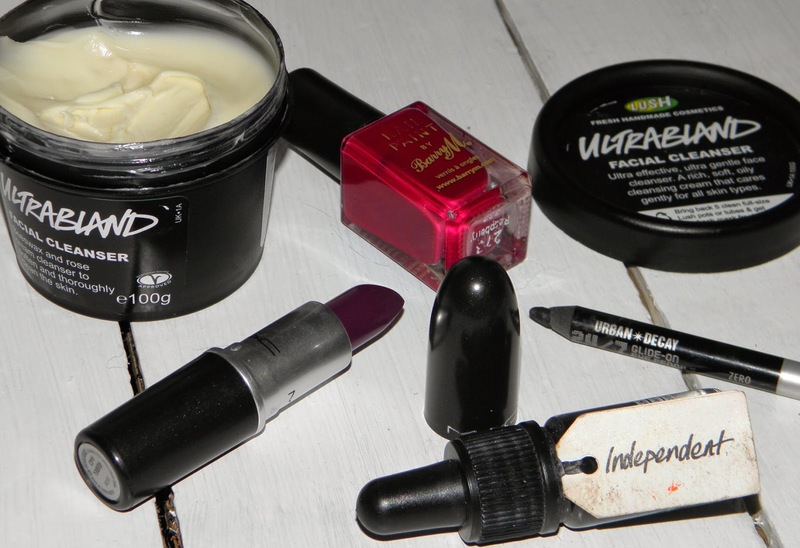 They are mostly old favourites that I have discovered or re-discovered in the last twelve months but, at the moment, they are products I find myself going to for my every day cosmetics. This is no surprise to those who follow me. I think Ultrabland is my all time favourite beauty product EVER. It removes every single type of make up. It's cleared my break-out prone skin up a treat; people have commented on how much better my skin looks! It feels luxurious to use, especially when I hot cloth it off. One pot lasts AGES. Need I say more? I actually bought this lipstick on a whim but I'm glad I got it as it has become one of my all time favourite lip colours! I had been looking for a deep berry shade for ages and Rebel is the perfect mix of deep red and purple that creates the berry colour I'd been searching for. The formula is great and lasts ages. When it does fade, it looks like a beautiful deep red lip stain. I love this lipstick. I've always had a soft spot for the 24/7 Glide-On eye liners by Urban Decay but I'd forgotten how amazing these pencils actually are! This shade, Zero, is a deep, true black. Once applied you have a few seconds to smudge (if you want to) and then it is set for the whole day! Even below the waterline, this eyeliner cannot be faulted as it's longevity on the skin is superb! I'll never try another pencil eye liner. Much like my obsession with the Urban Decay pencil, Lush's Independent Eyeliner is another liner I will never be without. This one is a liquid liner and it honestly lasts all day until you want to take it off. The formula glides on the skin and the pigmentation is amazing - it is a true black that you can build for an intense shade. This is the one nail polish I always come back to. I think it's just the perfect red shade and it's not too deep to not be able to wear it all year round (not that I follow colour trends anyway). It lasts ages on your nails without chipping too which is always a bonus! What are your favourite beauty products of this year? I really want to buy MAC's Rebel lipstick! It's such a gorgeous shade for the autumn/winter! I love the 24/7 eyeliners, they are great for smokey eyes. I really want to try Ultraband, I've heard many good things. Posts like this are lethal cause you just end up wanting to buy things ha ha. I've seen that Lush cleanser on a few blog posts and I'm interested to try it out to be honest. That lipstick looks like a goody too, berry and purple in one, sounds lovely!